Add an elegant touch to your home decor with this sophisticated satin nickel wall sconce. A beautiful cup shade in exquisite white marbleized glass creates a soft glow in this exceptional wall sconce. Curved metal arms in satin nickel finish draw back to the rectangular wall plate in a smooth, fluid movement. This versatile fixture can be installed with the light pointing up or down. 9" high x 6" wide. Extends 8" from wall. Weighs 2 lbs. Rectangular backplate is 7 1/4" high x 5" wide x 3/4" deep. Distance from mounting point to top of the fixture is 5 1/2" high. Glass shade is 6" wide x 5" high. 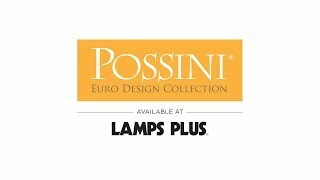 A sophisticated contemporary wall sconce from Possini Euro Design®. Satin nickel finish on the wallplate and twin arms. White marbleized glass. Vertical installation only. Can be installed with the glass pointed up or down.